I came here after 15 years working with the Department of Defense managing data security because the opportunity to design, build and run a SOC using the latest understanding of how to provide security was compelling. TPx Communications isn’t taking a breather following April’s successful launch of its new brand. It is continuing the “pedal to the metal” acceleration of its carrier-grade managed services and network connectivity to an expanded national customer market with its latest significant investment in a state-of-the art Security Operations Center (SOC) in St. Louis. Supported by a nationwide team of security analysts with deep military and intelligence backgrounds, TPx’s SOC provides 24/7/365 protection and mitigation against ransomware like WannaCry, DDoS attacks and an increasingly sophisticated panoply of threats to business information and security. TPx, formerly known as TelePacific, is systematically building on its understanding of carrier service – taking responsibility for the end-to-end communications that increasingly define today’s businesses – and seamlessly weaving them into the integrated set of managed services offerings that now form half of its nearly $700 million business. 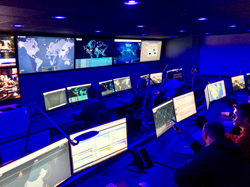 A key part of that equation is the new SOC, a blue-lit, screen-filled command center that keeps an eagle eye on all the activity traversing TPx’s customer networks. “Managed IT and cyber threats are growing exponentially and we’ve made a strategic investment to provide both the technology and intellectual resources to support our customers’ needs for military-grade cybersecurity that is integrated into all the services we provide them,” said Jared Martin, vice president of ITx Managed Services for TPx. The SOC was built from scratch to respond to today’s customer needs for security services, employing both physical protections to its operations in the form of multistep access protection that includes fingerprint and facial recognition, glass walls that can be clouded to shield the center’s activities when there are outside visitors, and shielded cabling and a wire mesh envelope in the floor and ceiling construction that guards against unauthorized intrusion. Needs for enhanced physical data protection driven by requirements like HIPAA, PCI and CPNI standards were all designed in. TPx plans to add an ever-increasing suite of solutions leveraging the SOC’s capabilities to its already broad set of security products. During the next six months, managed IT security offerings like DDoS protection and advanced endpoint protection that are designed for the challenges of a mobile, distributed workforce will be rolled out to business customers around the country. These services will let them concentrate on their strategic plans for business success, knowing that they are protected by the most powerful security options available.